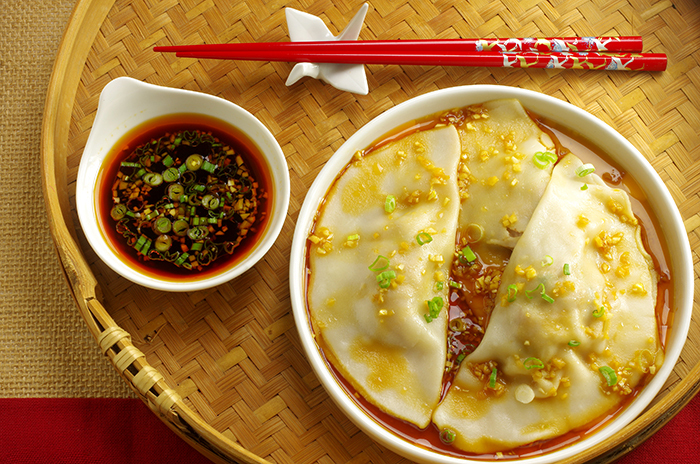 Bursting with flavor, these northern Chinese dumplings are a specialty of Beijing. Dating as far back as the late Han Dynasty (25 to 220C.E. ), plump boiled morsels such as these are members of the jiaozi family of dumplings, which include panfried guotie and steamed zhengjiao. 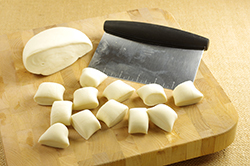 Jiaozi are not just for a modest snack or meal, they are a must-have for northern Chinese Lunar New Year celebrations. Their shape resembles gold ingots, harbingers of good fortune. Easy to make for a crowd, shuijiao (which means “water dumpling”) are especially good hot from the pot and tumbled in a soy-vinegar dipping sauce spiked with chile oil. 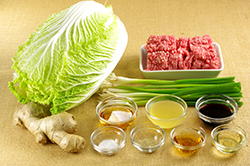 Pork and napa cabbage comprise the classic jiaozi filing, but you can use one of the lamb, beef, vegetable, or fish fillings on the following pages. 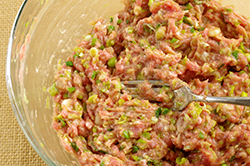 Or substitute chopped shrimp or reconstituted dried shiitake mushrooms for half of the pork. 1. 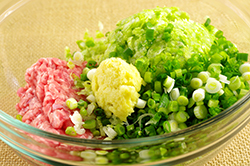 To make the filling, put the cabbage in a bowl and toss with the 1/2 teaspoon salt. Set aside for about 15 minutes to draw excess moisture from the cabbage. 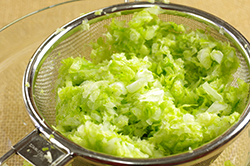 Drain in a mesh strainer (the cabbage could fall through the large holes of a colander), flush with water, and drain again. 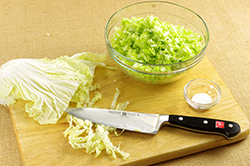 To remove more moisture, squeeze the cabbage in your hands over the sink, or put on a cotton kitchen towel (not terry cloth) and wring out the moisture over the sink. You should have about 1/2 cup firmly packed cabbage. 2. 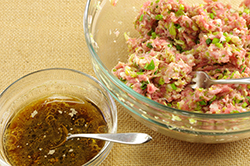 Transfer the cabbage to a bowl and add the ginger, Chinese chives, and pork. 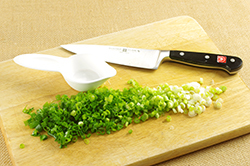 Use a fork or spatula to stir and lightly mash the ingredients so that they start coming together. 4. In the meantime, make 16 wrappers from half of the dough. Aim for 3-1/4-inch-diameter wrappers. 5. 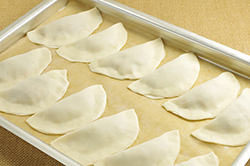 Before assembling the dumplings, line a baking sheet with parchment paper. (If you plan to refrigerate the dumplings for several hours, or freeze them, lightly dust the paper with flour to avoid sticking.) For each dumpling, hold a wrapper in a slightly cupped hand. Scoop up about 1 tablespoon of filling with a bamboo dumpling spatula, dinner knife, or fork and position it slightly off-center toward the upper half of the wrapper, pressing and shaping it into a flat mound and keeping about 1/2 to 3/4 inch of wrapper clear on all sides. Then fold, pleat, and press to enclose the filling and create half-moons, pea pods, big hugs, or pleated crescents. Place the finished dumpling on the prepared baking sheet. Repeat with the other wrappers, assembling the dumplings and spacing them a good 1/2 inch apart on the baking sheet. Keeping the finished dumplings covered with a dry kitchen towel, form and fill the wrappers from the remaining dough. 7. To cook the dumplings, half-fill a large pot with water and bring to a boil over high heat. Add half the dumplings, gently dropping each one into the water. Nudge the dumplings apart with a wooden spoon to keep them from sticking together and/or to the bottom of the pot. Return the water to a simmer and then lower the heat to maintain the simmer and gently cook: a hard boil can make a dumpling burst. Cook the dumplings for about 8 minutes, or until they float to the surface, look glossy, and are puffed up and a tad translucent. Use a slotted spoon or skimmer to scoop up the dumplings from the pot, a few at a time, pausing the spoon’s motion over the pot to allow excess water to drip back down before putting the dumplings on a serving plate. Cover the plate with a large inverted bowl to keep the dumplings warm. Return the water to a boil and cook the remaining dumplings. When done, return the first batch to the hot water to reheat for a minute or two. There is no need to reboil. 8. Serve the hot dumplings immediately, placing the serving plate in the middle of the table for people to reach to or pass along. Serve the soy dipping sauce either in a communal bowl with a spoon for people to help them selves or divided up among individual rice bowls or large dipping sauce dishes. To eat, pick up a dumpling with chopsticks (you can stab it if you like) and dip or roll it in the dipping sauce. Getting an assist from a soupspoon or the rice bowl, deliver the dumpling to your mouth with the chopsticks. If there are juices inside, they’ll spill out into the spoon or bowl when you bite into the dumpling. 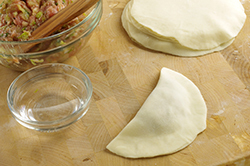 This dough is the foundation of many excellent dumplings, including Chinese jiaozi, Korean mandu, and Nepali momo. 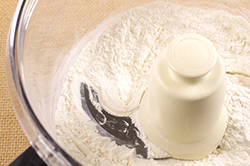 The process of making the dough is easy to master, especially with a little help from modern tools such as a food processor (though you can mix the dough by hand). Asian wheat flour wrappers may be made with cold or hot water -- the temperature is traditionally dictated by the cooking method. Boiled dumplings are said to require thicker skins made from cold-water dough in order to withstand the pressures of boiling, whereas panfried and steamed dumplings require thinner skins made from hot-water dough for their gentler cooking processes. Over the years, I’ve found that homemade wrappers of medium thickness, a scant 1/8 inch thick in the center and about 1/16 inch thick at the rim, work well for all cooking methods. If dumplings are gently boiled as described for shuijiao, there is no need for thicker wrappers. Producing medium-thick wrappers is easier with hot-water dough as it is more yielding than its cold-water counterpart. The resulting wrappers taste superior to store-bought ones, and they need no water to seal. Grocery store all-purpose flour with a moderate amount of gluten, such as Gold Medal brand, works exceptionally well. 2. Alternatively, make the dough by hand. Put a bowl atop a kitchen towel to prevent it from slipping while you work. Put the flour in the bowl and make a well in the center. Use a wooden spoon or bamboo rice paddle to stir the flour while you add 3/4 cup water in a steady stream. Aim to evenly moisten the flour. It is okay to pause to stir or add water -- it is hard to simultaneously do both actions. When all the water has been added, you will have lots of lumpy bits. Knead the dough in the bowl (it is not terribly hot) to bring all the lumps into one mass; if the dough does not come together easily, add water by the teaspoon. 3. Regardless of the mixing method, transfer the dough and any bits to a work surface; flour your work surface only if necessary, and then sparingly. Knead the dough (it is not hot) with the heel of your hand for about 30 seconds for machine-made dough, or about 2 minutes for handmade dough. The result should be nearly smooth and somewhat elastic: press on the dough; it should slowly bounce back, with a light impression of your finger remaining. 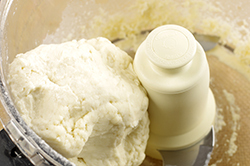 Place the dough in a zip-top plastic bag and seal tightly closed, expelling excess air. Set aside to rest at room temperature for at least 15 minutes and up to 2 hours. The dough will steam up the plastic bag and become earlobe soft, which makes wrappers easy to work with. 4. After resting, the dough can be used right away to form the wrappers. Or, refrigerate it overnight and return it to room temperature before using. 5. Note: Recipes for hot-water dough often call for boiling water to hydrate the dry ingredients, but I find that practice too dangerous and prefer to let the water rest first. For the just-boiled water, half-fill a kettle or saucepan with water and bring it to a boil. Turn off the heat and after the bubbling action subsides, 30 to 90 seconds (depending on the heating vessel), pour the amount needed into a glass measuring cup and use for making the dough. I typically wait no more than 2 minutes after boiling to use the water. You can substitute purchased wrappers for homemade ones. 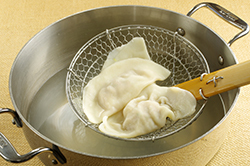 Medium-thick pot sticker wrappers are good for boiled, panfried, and steamed dumplings; however, they do not deep-fry well. Sui gow wrappers are typically made relatively thick for boiled dumplings. If your wrappers are soft and fresh but on the thick side, try rolling them to create thinner ones. A commercially made wrapper holds less filling than a homemade one, so your yield will be higher for the filling recipes here. When using store-bought wrappers, moisten the edge with water to seal them. Purchased wheat flour wrappers are best used for shaping half-moons, pea pods, pleated crescents, and big hugs, but not closed satchels. 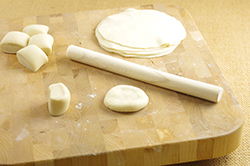 Wrappers formed from basic dumpling dough are traditionally rolled out individually by hand with a skinny wooden rolling pin. I like to cut down the work by employing a Mexican tortilla press to first quickly flatten the dough into a thin disk and then finishing the job with the skinny rolling pin. You can use some other kind of heavy, flat-bottomed object, such as a 4-cup glass measuring cup, but it will require a little more energy than the press. Regardless, have on hand two 6 to 7-inch squares of medium-heavy plastic (I cut them from a zip-top freezer bag) for the pressing. Make sure to use a spacious work surface (for example, a large cutting board), lightly dusted with flour and with about 1/4 cup of additional flour in one corner for dusting. And regardless of how you initially flatten the dough, you’ll definitely need the small rolling pin to finish the wrappers. Have your filling ready to go before you start rolling, as you’ll want to fill the wrappers fairly promptly after they are rolled. 1. Remove the dough from the bag, turning the bag inside out if the dough is sticky. Put the dough on a lightly floured work surface and cut it in half. Put half back in the bag, squeezing out the air and sealing it closed to prevent drying. 2. 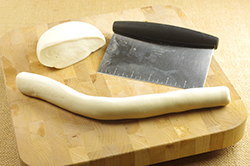 Roll the dough into a 1-inch thick log, and then cut it into the number of pieces required by the recipe. To cut even pieces, quarter the log first; the tapered end pieces should be cut a little longer than the rest. Weigh each piece of dough to be super precise, if you like. 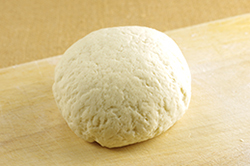 If your dough pieces are oval shaped, stand each one on a cut end and use your fingers to gently squeeze it into a round. The resulting squat cylinder resembles a scallop. This bit of advance work makes it easier to form a nice circle in the remaining steps. 3. To prevent the dough from sticking and to flatten it a bit, take each piece of dough and press one of the cut ends in flour, then flip it over and do the same on the other ends; the dough can be sticky. You should end up with a disk roughly 1/4 inch thick. As you work, set the floured disks to one side of your work area. 4. Next flatten each dough disk into a thin circle that is about 1/8 inch thick, either with a tortilla press or with a heavy, flat-bottomed object. If you are using the tortilla press, open the press and lay a plastic square on the bottom plate. Center a disk of floured dough and cover with the other plastic square. Close the top plate, then fold the pressure handle over the top plate and press down. 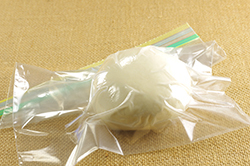 Use moderate pressure and press only once, or the resulting wrapper will stick to the plastic and be hard to remove. Fold back the pressure handle, open the top plate, and peel off the top plastic square. Then gently peel the wrapper off the bottom plastic square. Should the wrapper feel tacky, lightly swipe both sides on some flour before placing on the work surface. Without the tortilla press, put the floured disk between the plastic squares and press down with a heavy object to produce a circle about 1/8-inch thick. You may have to press more than once. Gently peel the plastic from the wrapper. Regardless of method, repeat with the remaining dough pieces, setting them to one side of the work area as you finish them. It is okay to overlap the wrappers slightly. 5. To finish the wrappers, take a wrapper and place it on the work surface, flouring the surface only as needed to keep the dough from sticking. Imagine a quarter-sized circle in the center. This is what the Chinese call the “belly” of the wrapper. You want to create a wrapper that is larger than its current size but retains a thick belly. This ensures an even distribution of dough after the wrapper’s edge has been gathered and closed around the filing. To keep a thick belly, use the rolling pin to apply pressure on the outer 1/2 to 3/4-inch border of the wrapper, as follows. Try to roll the rolling pin with the flat palm of one hand while using the other hand to turn the wrapper in the opposite direction. For example, as your right palm works the rolling pin in short, downward strokes from the center toward your body, the fingers of your left hand turn the disk counterclockwise about one-quarter of a turn between each stroke. Keep the thumb of the rotating hand near the center if the wrapper to guide the rolling pin and turn the wrapper. If the wrapper sticks to the work surface or rolling pin, pause to dust the wrapper with flour and then continue. If you cannot get a wrapper thin enough on the first try, set it aside to relax for about 1 minute, and then roll again. Should the wrapper tear or be hopelessly misshapen, roll up the dough, let it rest for a few minutes, them press it again and roll it out. Resembling a flat fried egg, the finished wrapper does not need to be a perfect circle. Frilly edges are fine. 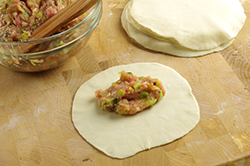 The finished diameter of the wrapper depends on the dumpling, and each recipe provides an ideal size. Wrappers made from the Basic Dumpling Dough are moderately thick and suitable for boiled, steamed, panfried, and deep-fried morsels. As you work, line up the finished wrappers on your work surface; if you need extra space, use a baking sheet lined with parchment paper and dusted with flour. A bit of overlapping is fine, but avoid stacking the wrappers. When a batch of wrappers is formed, fill them before making wrappers out of the other portion of dough, or the wrappers may stick together as they wait for you. Use the instructions in the recipe to fill, shape, and cook the dumplings. Great on their own, Chinese jiaozi get a fantastic flavor boost when dipped in a zippy sauce like this one. The tart-salty-spicy combination adds a complex edge to the dumplings. There’s no such thing as a definitive dipping sauce, since cooks and diners mix up their own according to personal taste. At the least, your sauce should be tangy and savory. But add some nutty, hot chile oil, and your eating experience will enter a different orbit. Chinese dumplings are wonderful with an extra kick of ginger or garlic in the sauce, too. I prepare the sauce in advance, but you can set out the ingredients and invite guests to do it themselves. 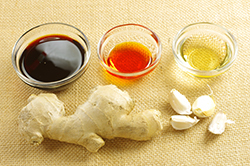 Combine the soy sauce, vinegar, and sugar in a bowl. Stir to dissolve the sugar. Taste and adjust the flavors to your liking for a tart-savory balance. Add as much chile oil as you like for some heat. The sauce can be prepared several hours in advance up to this point. 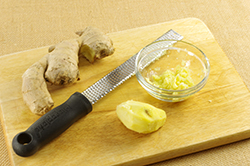 Right before serving, add the ginger or garlic for a fresh layer of punch. Recipes from Asian Dumplings by Andrea Nguyen. Published by Ten Speed Press, an imprint of Crown Publishing, New York, NY. Copyright 2009. Reprinted with permission of the publisher.